GUATEMALA CITY The discovery of a tomb that experts believe might be that of a great Maya queen could redefine the understanding of women's political roles during the Classic Maya period, experts said Thursday. 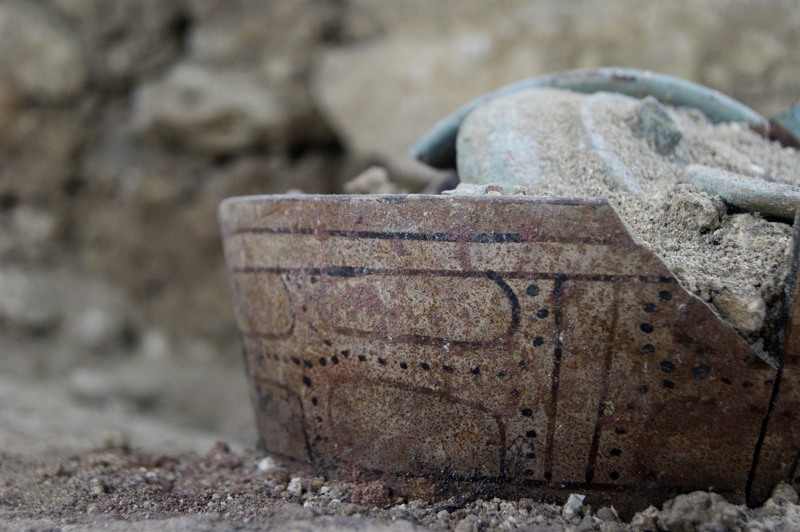 A team of U.S. and Guatemalan experts led by anthropologist David Freidel found a stone jar at a burial chamber in northern Guatemala that led them to believe it is the burial site of Lady K'abel, considered the military governor of an ancient Maya city during the 7th century. "Lady K'abel was buried 11 meters down from the surface in a temple near a stairway," Freidel said. "K'abel was not a regular person. To put her in that location means that it was important; it means that people continued to worship her after the fall of the dynasty." The team working in the royal Maya city of El Peru-Waka also found other evidence, such as ceramic vessels, jade jewelry, thousands of obsidian blades and a large stone with carvings referring to Lady K'abel. The alabaster jar showed the head and arm of an aged woman emerging from the opening and glyphs pointing to the name of the queen, Guatemala's cultural ministry said in a statement Thursday. "The royal tomb shows that women have been leaders in the past and we must now assume and exercise political participation to strengthen the role of women in the new era," Rosa Maria Chan, deputy minister for cultural and natural heritage, said in the statement. K'abel, considered the greatest ruler of the Late Classic period, ruled with her husband, K'inich Bahlam, for at least 20 years in the 7th century, Freidel said. She was the military governor of the Waka kingdom for her family, the imperial house of the Snake King, and she carried the title "Kaloomte"  translated as "Supreme Warrior," higher in authority than her husband, the king. Freidel, who is from Washington University in St. Louis, said the findings at the ruins of El Peru-Waka were "serendipitous." "In retrospect, it makes a lot of sense that the people of Waka buried her in this particularly prominent place in their city," Freidel said. For Marcello A. Canuto, director of the Research Center of Central Tulane University in Louisiana, the alabaster identifies the tomb as that of the "Lady of Kaan" and noted there is a stela erected in her honor at the archaeological site. "She has been given all the honors a male king would have been given," Canuto said. "It's not the first such tomb discovered, but it gives an idea of the important role women played in forging dynastic alliances, and the status they enjoyed." Traci Ardren, associate professor of anthropology at the University of Miami and a Mayan archaeologist specializing in gender relations, said the traditional belief that Maya men occupied a more important place than women has to do with the amount of images in Mayan art that show men in positions of authority. "People like Lady K'abel show there were examples of extraordinary women who occupied powerful positions than men, which were successful and which were accepted by society," Ardren said.